The first session after lunch on the sixth day of the Monlam always contains prayers and dedications for the deceased, and is a precursor to the Akshobhya Fire Ritual held later on the same day. The afternoon session begins with the recitation of the confessional The Sutra in Three Sections, followed by the two dharani sutras of the Buddha Akshobhya: The Dharani that Thoroughly Purifies all Karmic Obstructions and The Sutra of the Dharani that Thoroughly Liberates from Suffering [Kagyu Monlam Book p.491-497]. 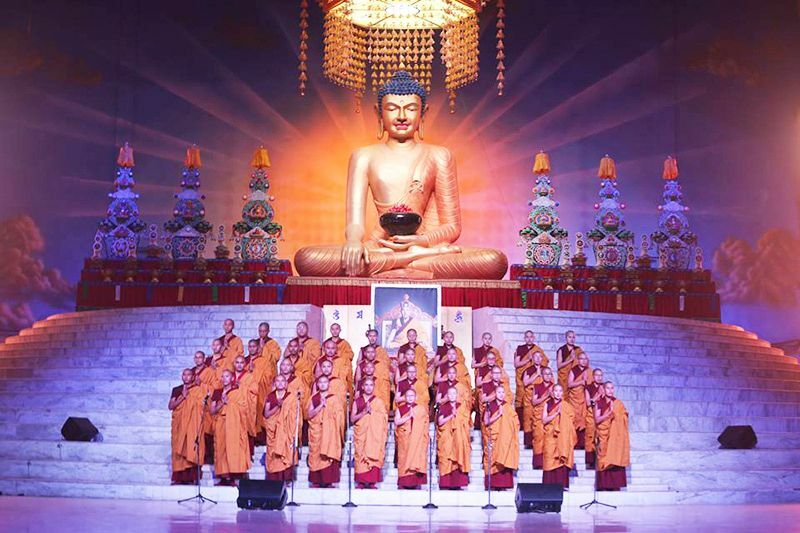 The session concludes with the chanting of An Aspiration for Rebirth in the Realm of Abhirati, the pureland of the Buddha Akshobhya. This year the session began with a pre-recorded video message from the Gyalwang Karmapa. This afternoon of the sixth day of the Kagyu Monlam, we recite for the sake of the deceased The Sutra in Three Sections, which is also known as Confession of Downfalls, the sutras of the dharani of Akshobhya, and the Aspiration for Rebirth in the Realm of Abhirati. I would like to take this opportunity of dedicating the virtue for the sake of the deceased to make a request to all of you. On the screen, you should soon see a picture of Neyratsang Lhundup. 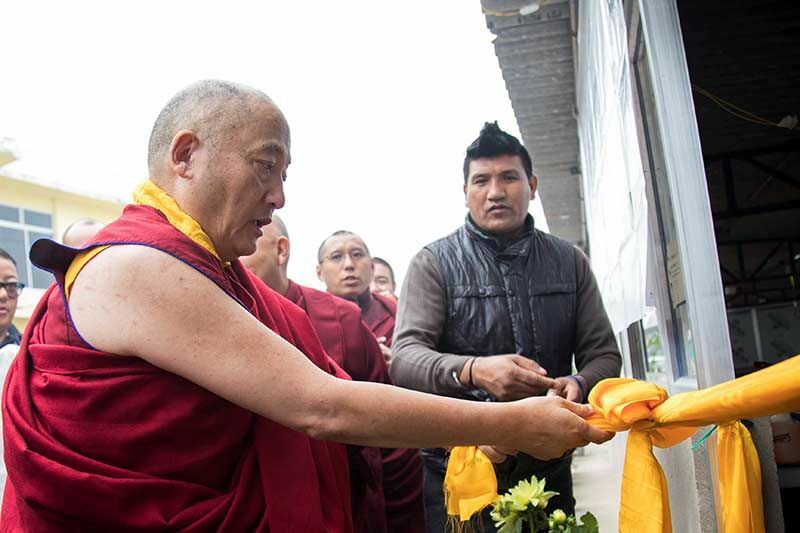 He was associated with the Palpung Sherap Ling monastery, and he and his twin brother, Gyaltsen, were connected to Situ Rinpoche. Actually, they had a family connection with Palpung Sherap Ling, and both of them served Palpung Sherap Ling in many ways, becoming important individuals, serving the guru and accomplishing his wishes. 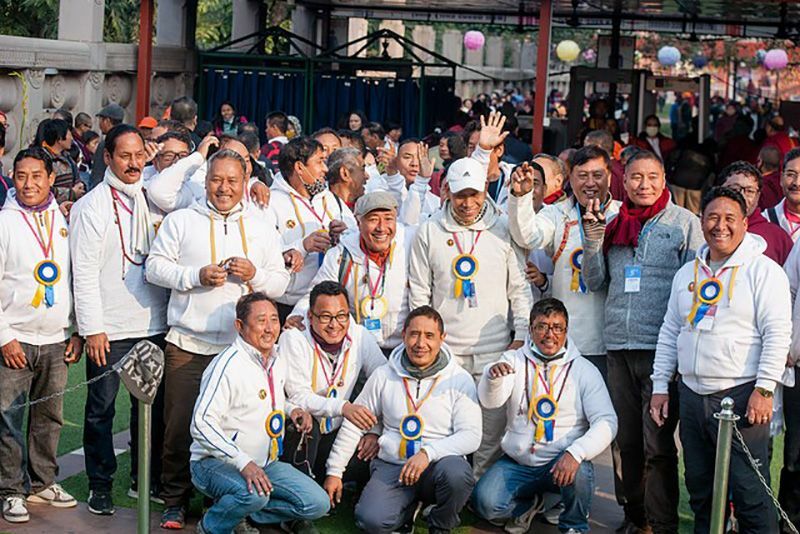 Likewise, when I came to India, as soon as I came out of Tibet, Gyaltsen Neyratsang helped me come as far as the Nepalese border, helping me greatly, and was very kind to me. 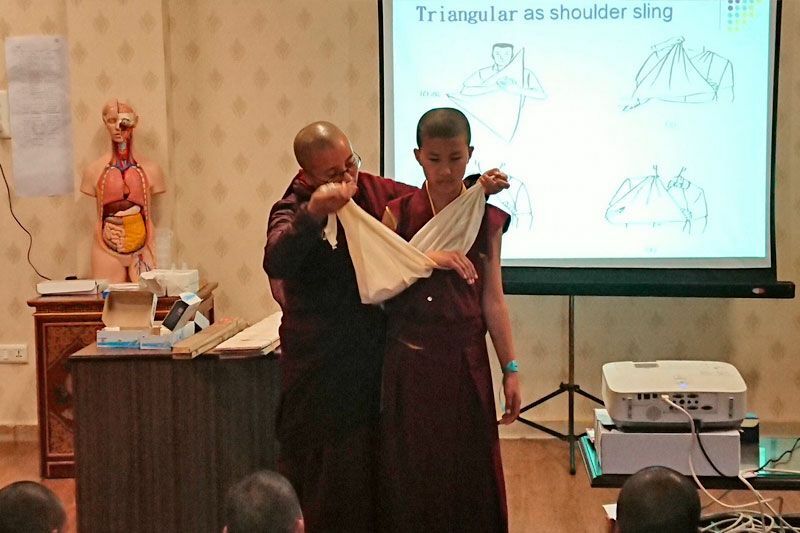 With regards to the Kagyu Monlam, both brothers were invaluable and had incomparable enthusiasm and dedication. In particular, Lhundrup stayed here even during the hottest time of the summer when few people were here and worked on the construction of the Monlam Pavilion as well as the new dining hall. In the end, when he died suddenly, it was while he was working for the Monlam, so we all felt his loss strongly. So I would like to take this opportunity to ask, on his behalf, the source of refuge-the community of the sangha- and everyone else gathered here to make prayers and dedications for his sake. To me, he was someone who had one-pointed faith in his guru. Whatever he was asked to do, he did it without any ambivalence or doubt. Thus, I am certain that he will be cared for by the glorious, exalted gurus and never be separated from the glory of the True Dharma in all his lifetimes. Likewise, Sun Chuan Hua, the mother of Ani Miarong from Taiwan, is someone whom I knew since I was little. She had great faith in the dharma, and in addition began many projects on behalf of the dharma. She was an individual who naturally gathered a great deal of virtue. She also passed away last year, so I pray that, just as she wished, she may be reborn in the pure realm of Sukhavati and be cared for by the protector Amitabha and all the buddhas of the ten directions. And once again, in the future, take an intentional rebirth as a bodhisattva for the sake of beings. Also, when I was young, while I was little, before I was recognized as the Karmapa, we had some neighbors who were named Kya Ngen and Tsu Ga. They were a mother and daughter who lived all by themselves. They became dharma practitioners late in life. They were very loving to me when I was young and were very respectful to me—they treated me with great faith and devotion. Everyone else said there was no reason at all to treat me with faith and respect, and even my family members would say, “Why would Kya Ngen and Tsu Ga treat you with such faith and devotion?” But they would always give me nice food and treat me well with faith. So when I was little, whenever I had the chance, I’d go off to their home and see if there was anything to eat or drink, and eat or drink it if there were. So they were very kind to me when I was young. The mother, Kya Ngen, passed away a long time ago, and it has been just about a year since Tsu Ga passed away. So these are the most important people whom I am connected to, because they treated me so well when I was little. 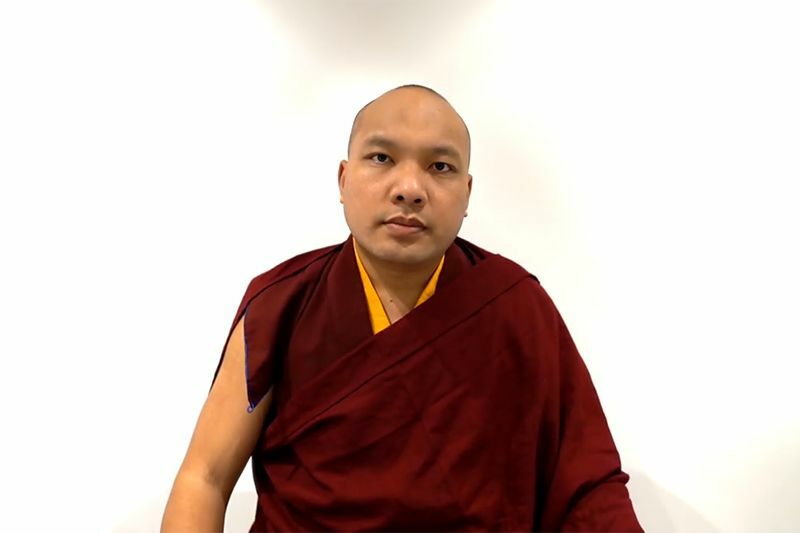 When I was recognized as the Karmapa, there were plenty—filling space—who treated me well, but before then, they were the two main people; they treated me specially. So I would like to ask you to please make the aspirations and dedications that they may never be separated from the light of dharma in all their lifetimes, all their births. Finally, it is because of the dedications on behalf of the living and deceased—the food of the living, the food of the deceased —that we are able to hold this Monlam. So, I think that it is crucially important for us to make aspirations and dedications that their intentions be fulfilled as they wanted them to be, and for them for them to experience happiness in the short term as well as ultimately. These dedications and aspirations should not be something we merely recite. If we make our prayers from the depths of our heart, imbued with compassion and bodhichitta and embraced by a mind that does not conceive of the three spheres, if we can do this, I think that all the virtue they have accumulated will definitely become meaningful. For that reason, I would like to ask His Eminence, the regent of the Buddhas, Drung Goshri Gyaltsap Rinpoche, Mingyur Rinpoche, and likewise all the lamas, tulkus, spiritual friends, the ocean of the sangha, and all the faithful members of the public to please make these prayers with your minds in unison. Thus I ask you to pray that all sentient beings who have passed away, our fathers, mothers, and spiritual masters foremost, be liberated from the terrifying panic of the bardo in the short term, and ultimately easily achieve the state of omniscient buddhahood.